Scene 6: Céile: Traditional group: Jigs, Reels and brush dance. Traditional group and friends celebrate Irish culture. Finale: Twelve Days of Christmas according to the T.Y’s. Narrator: The wild and disunited Ireland of the Celts which for years became the fountainhead of Christianity; the intrusion of the Danes and the Normans who began to colonise and urbanise Ireland. We then had years of ascendency when new populations and a new language were planted. We had the upsurge of Irish Nationalism in the 1800’s. Ireland was a nation in turmoil. Scene 1 involves Ireland a nation in turmoil with a battle on stage involving swords and muskets with haunting background music. Narrator: Back in the end of the 16th Century, the great chieftain Hugh O’ Donnell wrote a poem about Ireland; the poem was a study about his great love for his country and his hopes and dreams he had for her. He referred to Ireland not as a country but as an aristocratic lady, Dark Rosaleen. The poem was later translated by James Clarence Mangan. 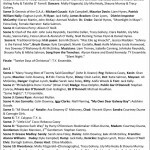 This is reputed to be Hugh O’Donnell’s thoughts on Dark Rosaleen. My Dark Rosaleen by James Clarence Mangan sung by the first year music class and second year students. Shall give you health and help, and hope,My dark Rosaleen.4-5 Irish dancers symbolic of that era. Narrator (Dressed in modern clothes) looking back at history. Ladies and gentlemen, the last Century has been a century of change. Empires which took generations to build have been swept away; powerful institutions founded on ideology have been created and destroyed. In Ireland in the late 19th Century political nationalism reached a crisis point with the fall of Parnell. In its wake a new form of nationalism emerged in the form of cultural nationalism which was a movement to DE anglicize Ireland with the revival of Irish literature, the Irish language and Irish sport and to acknowledge the part played by the GAA in helping restore independence from 1921 onwards. An organisation was set up with a stated objective to keep Irish men fit and ready if called into action against the English forces. Hayes’ Hotel : members attending standing. It all began in Hayes’ Hotel on November 1st 1884, at the behest of Michael Cusack, seven men met in Hayes’ Hotel Thurles and founded the Gaelic Athletic Association for the preservation and cultivation of national pastimes; its purpose was to promote Gaelic Football, hurling, rounders and athletics. The following attended the meeting Michael Cusack, Maurice Davin, PJ Ryan, John McKay, James Bracken and District inspector McCarthy. At the meeting Davin was selected as president while Cusack was chosen as one of three secretaries. I was born in Carran north Clare. During the famine I taught in a number of national schools in various parts of Ireland. Later, I became a professor in Blackrock College. In 1877, I opened an Irish academy in Dublin called the Cusack academy and I prepared students for the civil service examinations. I was active in the Gaelic revival and I was a member of the society for the preservation of the Irish language. On one occasion I was walking through the Phoenix Park with Patrick William Nally and we were disgusted to see how few Irish people used the park for fitness. We decided that we must do something to preserve the fitness of our race. Sport at that time was the preserve of the middle classes. I believed that political independence was not an end in itself and true freedom would only come when the nationalist community had its own separate cultural identity through its language and games, music and dance. I was a pioneer of the Irish language revival movement. I was a well-known figure around Dublin and I carried a blackthorn stick which was dubbed “bas gan sagart” death without a priest. Narrator: Archbishop Thomas Croke of Cashel, Michael Davitt and Charles Stewart Parnell were asked to become patrons of the new association. In the late 19th Century the GAA was actively linked with other bodies cultural and semi-political. I was born near Carrick on Suir on the 29th June 1842. I was an excellent athlete, especially at throwing events. I held records for running, throwing and hurdling. As an athlete, I was highly respected internationally and regarded as one of the best athletes in the world for a period. The laws under which athletic sports are held in Ireland were designed mainly for the guidance of Englishmen, and they do not deal at all with the characteristic sports and pastimes of the Irish race. Irish football is a great game, “but there are no rules for either hurling or football and they are often dangerous”. In 1884 Michael Cusack approached me about his idea of forming a new sporting organisation which would be controlled by ordinary Irish men. I supported the idea and I set about publishing a set of rules for football and hurling. At that historic meeting in Hayes’ Hotel, I became president of the Gaelic Athletic Association. I was often described as the rock on which the association survived turbulent waves. I hosted the 1904 all Ireland final between Kilkenny and Cork on my farm. Maurice Davin was honoured by the GAA when the Canal end of Croke Park was renamed the Davin stand in his honour as are some GAA clubs throughout the country including Carrick Davins in Tipperary. Every year in his home town of Carrick-On-Suir on the 27th of December the Maurice Davin awards take place. These awards celebrate inter county talent from the tri-county area of Tipperary, Kilkenny and Waterford as well as members from local clubs. I was born in Balla Co Mayo March 17th in 1855. I was a very good athlete. I was a member of the Irish Republican Brotherhood. I believed that sport should be open to all classes. I was never a member of the association but the fact that I was a founder member of the Land League gave me some influence with the association and I was a very good friend of Michael Cusack. I was a Fenian and I became well known for organising ahtletics’ meetings which were open to all members of the public because previous to this, athletics’ meetings were confined to the protestant ascendency or the ruling class. I was also a member of the Republican Brotherhood and I was arrested and imprisoned. In 1952, the GAA erected a stand to commemorate a man in the same tradition as Croke, Cusack and Hogan. Patrick William Nally was arrested and sent to Mountjoy prison and died from Typhoid fever before he was released at the tender age of 36. One of the stands in Croke Park is named after Nally, and is unique for being the only stand in the stadium named after a person who had no connection to the Gaelic Athletic Association. I was born Castlecor in Cork, May 1823, I received my secondary education in Charleville. I attended the Irish College in Rome and the Irish College in Paris I became a lecturer in Carlow College and then I took up another academic appointment as professor of Dogmatic Theology at the Irish College in Paris. I returned to serve the communities of Charleville, Middleton and Mallow as Curate. I became President of St Colman’s College Fermoy Archbishop of Cashel in 1875. I became Bishop of Auckland, New Zealand where I built many churches and converted many Maori to Christianity. I returned to Ireland in 1875 and became Bishop of Cashel and this coincided with the founding of the G.A.A. I was a strong supporter of Irish Nationalism and the Land League. I believed that the GAA would do for sport what the land league did for tenant farmers. I accepted the role of patron of the association. During his time in education he won major academic achievements including a Doctorate of Divinity. Dr Croke had an extra-ordinary life and influenced many spheres in Irish society including religious, sporting and political nationalism in the 19th Century Ireland. The main Gaelic Athletic Association stadium in Dublin is named Croke Park, in his honour. 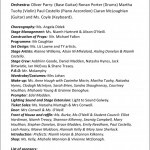 Fiona Daly will sing “Moonlight in Mayo”. Stage crew need a chair left foreground on stage for Fiona. In 1903 Maire Ni Chinneide, Sean O’Ceallaigh, Tadhg O’Donoghue and Seamas O’Braonain came together and adopted hurling into a game for women. Camogie was founded in 1905 by Maire Ni Chinneide and Cait Ni Dhonnchadha, two prominent Irish- language enthusiasts and cultural nationalists, these two ladies were credited with having created the sport with the assistance of Tadhg O’ Donnchadha who helped draw up the rules. Camogie emanated from the Gaelic League and it was the only organisation to accept female and male members on an equal footing. Later the organisation became Cumann Camogiochta and has a similar structure to the G.A.A. The official launch of Camogie took place with the first match between Craobh Ui Cheithnigh and Cuchulainn on July 17th 1904 at a Gaelic League fair in Meath. It must be stated that those meeting in the Hayes’ hotel in 1884 gave little thought to the women of Ireland. The early part of the G.A.A. was dominated by male players and officials. We sent our very own Caitriona Perry to report on a unique story concerning the sliothar; Alyson O’Neill has the report. Eric: What’s all this about a sliothar? One of Michael Cusack’s efforts to promote the game of hurling soon after the foundation of the GAA was the provision by Cusack of an exhibition match in the Phoenix Park between a team of Dublin hurlers. Michael Cusack came home to his native Carron in Clare for his Christmas holidays. He wrote a letter to his friend Frank Moloney of Nenagh requesting if he could pick a north Tipperary team to take on the men of south Galway. Michael Cusack meanwhile met Dan Burke of Gort whom he asked to pick a south Galway team to take on the men of Tipperary. Cusack decided to shelf the idea of two Dublin teams playing in the Phoenix Park in Favour of a Galway and Tipperary team. Dan Burke and Ned Treston the captain of the Gort team were responsible for picking the Galway team. The teams had meals in the Clarence Hotel in Dublin and Cusack had a meeting with both teams where they both agreed to the rules. The next item on the agenda was the type of sliothar to be used in the game. Tipperary showed Cusack their sliothar but Galway objected to this sliothar on the grounds that it was too big. Michael Cusack asked the men from the west to show them the Galway sliothar but they realised that they had left it at home in Gort. The teams marched from the Clarence Hotel to the Phoenix Park complete with hurleys; all 42 of them with the substitutes carrying the goal posts. When they arrived at the Phoenix Park they marked out the pitch with their coats. The match was billed by Cusack as the 1886 Championship Final of Ireland. Cusack refereed the game. Galway objected to the Tipperary dress and Cusack conceded to this but decided that the match should go ahead irrespective. The Galway team had Knickerbockers made from corduroy material purchased in Huban’s drapery in Gort. During the course of the game however, and because of the severity of the tackling the stitching on the knickerbockers gave way and several Galway players had to depart from the game due to garment embarrassment. Tipperary won the match and when they arrived back in Nenagh to a heroes welcome; 4000 turned out to welcome home the victorious team. The Brass band in Gort welcomed back their heroes. Galway players from certain clubs felt the team wasn’t a representative Galway team. Another game was organised with team members from Craughwell and other clubs Tipperary again played Galway, this time in Limerick and 30,000 attended the match. Unfortunately Galway lost once more and both teams were hosted and received a hospitality meal from St Michael’s Temperance society. Narrator: Hurling remains one of the fastest games in the world, the clash of the ash, the block and the sight of a player in full flight soloing down the field; this next dance represents our Irish games, it is the dance of the Clash of the Ash. Now we present the music classes playing Irish music featuring the Accordion and violins with the “Traditional Band” and friends, celebrating Irish culture. The GAA is there as the strongest organised and patriotic body whose duty it is to expose, counter and nullify anything inimical to the accepted national ideal. The GAA believed that they were an organisation to prevent the torrent of propaganda swirling through Ireland, as it would blunt the national conscience, weaken the national fibre and sabotage the Irish revival and prevent the destruction of the Irish mentality. Now we present the Clash of the Ash. Narrator: The instruments best suited to render this air authentically are the native Irish uillean pipes, flute, fiddle and whistle as these are capable of making the “caoine” the note changing and shaping that is characteristic of native Irish music. As a nation it was an organisation like the GAA that helped to prevent the widespread loss of faith, hope and charity in the stated national aspiration for revival. Courtney introduces the poem by Eoin McClearn. Aoife Mahony and Linda Harewood: reel. 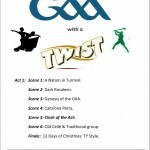 Twelve Days of Christmas Transition Year style. On the first day of Christmas, my teacher said to me, complete a project on the GA.A. tree. 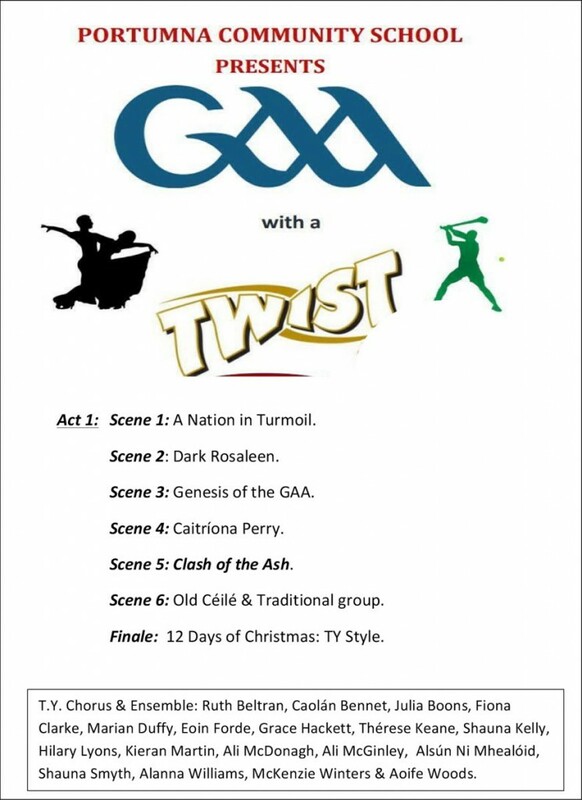 On the second day of Christmas my teacher said to me read about Michael Cusack and complete a project on the GAA tree. 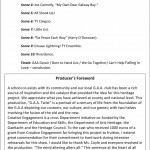 On the third day of Christmas my teacher said to me, visit the GAA museum, read about Michael Cusack and complete a project on the GAA tree. On the fourth day of Christmas, my teacher said to me, research Galway versus Tipperary in 1883, visit the GAA museum, read about Michael Cusack and complete a project on the GAA tree. On the fifth day of Christmas, my teacher said to me, gather all the props, research Galway versus Tipperary in 1883, visit the GAA museum, read about Michael Cusack and complete a project on the GAA tree. On the sixth day of Christmas, my teacher said to me, check all the costumes, gather all the props, research Galway versus Tipperary in 1883, visit the GAA museum, read about Michael Cusack and do a project on the GAA tree. On the seventh day of Christmas my teacher said to me, stop delaying, check all the costumes, gather all the props, research Galway versus Tipperary in 1883, visit the GAA museum, read about Michael Cusack and do a project on the GAA tree. On the eighth day of Christmas, my teacher said to me do all the PR work, stop delaying, check all the costumes, gather all the props, research Galway versus Tipperary in 1883, visit the GAA museum, read about Michael Cusack and do a project on the GAA tree. On the ninth day of Christmas, my teacher said to me, put all the show together, do all the PR work, stop delaying, check all the costumes, gather all the props, research Galway versus Tipperary in 1883, visit the GAA museum, read about Michael Cusack and do a project on the GAA tree. On the tenth day of Christmas, my teacher said to me, there’s lots more work to do, put all the show together, do all the PR work, stop delaying, check all the costumes, gather all the props, research Galway versus Tipperary in 1883, visit the GAA museum, read about Michael Cusack and do a project on the GAA tree. On the eleventh day of Christmas, my teacher said to me, get the songs right, there’s lots more work to do, put all the show together, do all the PR work, stop delaying, check all the costumes, gather all the props, research Galway versus Tipperary in 1883, visit the GAA museum, read about Michael Cusack and do a project on the GAA tree. On the Twelfth day of Christmas, my teacher said to me, congratulations on Portumna’s four “ More cups”, get the songs right, there’s lots more work to do, put all the show together, do all the PR work, stop delaying, check all the costumes, gather all the props, research Galway versus Tipperary in 1883, visit the GAA museum, read about Michael Cusack and do a project on the GAA tree. Mr Coughlan T.Y’s back, back and curtain. At least 8 million men, women and children emigrated from Ireland between 1801 and 1921. That number is equal to the total population of the island in the fourth decade of the 19th century. The high rate of Irish emigration was unequalled in any other country and reflects both the overseas demand for immigrant labour and the appalling lack of employment and prospects for the average Irish person. The problem of emigration continued into the 20th Century and right up to the 50’s and 60’s. This was given voice by many Irish writers including John B Keane in his play “Many Young Men of Twenty Said Goodbye. 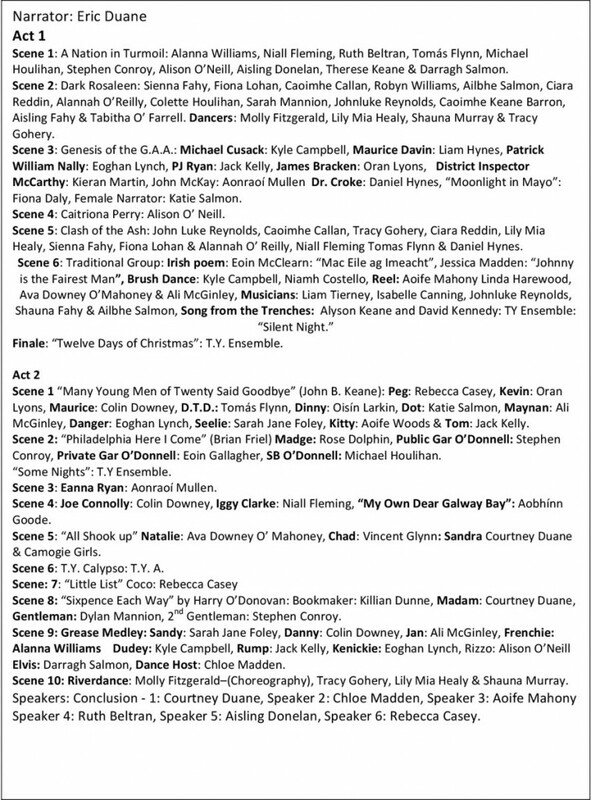 Here we have the Transition Year to present their interpretation of the final scene of the play. The play reflected very much the prevailing mood of much of the 20th Century Ireland. Many Young Men of Twenty: scene from the play. Peg: No… I don’t think so! You don’t need me so badly. You’ll work out fine. Kevin: But why… It’s a grand chance for you…… you’ll never do any good for yourself here. Peg: I like you Kevin, Kevin. You’re sensible and ambitious and you know where you are going. But you see I am not too keen on sensible young men who know where they are going and anyway I made a vow that I would never send a son of mine to England. Kevin: Who is it? Your man over there?…. He’s an alcoholic! Peg: No I don’t think he is somehow. He could be. But he isn’t one yet. Kevin: Is it because of him, you won’t come with me? Maurice: You can tell me clear out if you like, but I have something to say too. I take it he asked you to go to England with him. Kevin: I don’t see why you should interrupt a private conversation! Maurice: I ‘ll tell you why! Because I have a claim to stake, too, (Turns to Peg) I want you to come to England with me. I love you and I can’t bear the thought of anybody else marrying you, and you’re the only hope I have……. so now. Peg: (Affected but hurt) :Oh Maurice. Kevin: What about the baby? Maurice: If she’ll have me, I’ll have her baby and mother or anything else she wants. Peg: You are a fool to go to England, Maurice! You could do so much here. I heard you talking to the T.D. this morning. You only said what everyone is thinking. You have the guts Maurice and the education. Maurice: But I don’t want to go. I’ll stay here if that’s what you want. I’ll do anything you want me to do. I’ll teach in Dublin, Cork, Waterford or Limerick, if you’ll marry me? What do you say? Peg: I say stick it out here in Keelty, come hell or high water T.D. or no T.D. Maurice: With you behind me, he’d have a job shifting me out of Keelty. You ‘l marry me Peg? Enter Dawheen, Timminee, Din followed by a procession of five with suitcases. D.T.D: A half whiskey, a halfa port wine and two minerals. To Dot, what’s for you? DOT: A gin and it. Dinny: I’ll have a brandy. D.T.D. : There is a frightful test for ye over there. Go to bed early at night, and talk to no one with a strange accent. Don’t forget to send home a few pounds now and again and, above all, don’t attempt to ate mate on a Friday. Maynan: Keep yerselves to yerselves and yeer own brothers and sisters over. Call every stranger you meet “sir” and don’t forget the hail Mary’s for a happy death and purity, and praise be all on high ye’ll be accredit to yeer father and mother. D.T.D: Don’t go spending money foolish. Spare every half penny because there’ll be a great scarcity o’ money before the end o’ the year. I saw it in Old Moore’s Almanac. Danger: Twill ruin the small farmer! D.T.D: No one talking to you! Danger: So you’re sending another shipment this morning. Tis worse than the horse trade. D.T.D. : (To Maynan) drink that up. There’s milk for the creamery. Danger: (To D.T.D) Promise me you won’t cry. I couldn’t stand it. Danger: We’ll always be going from this miserable country. No one wants us. There is your Ireland for you, with grief and goodbyes and ullagoning at every railway station. What honest a God politician with an ounce of guts in him would keep his mouth shut when he sees theb father of a family going away alone with his heart broke, leavin’ his poor children behind him. “Tis the end of the world for them because their father is leavin’ them behind. What man with a drop of honest blood in his veins, wouldn’t rise up and shout stop this cruelty. Stop tearin the hearts out of innocent people! Stop sittin’ down on yeer backsides an’ do something. D.T.D: (To Maynan) Come on! The milk will be sour in the tanks To Mary and Micky) Say goodbye to yer mother now. D.T.D: Have you the “Knock water”? D.T.D: Don’t forget the few pounds an God bless ye all! Seelie: What’s all this racket? What’s this bar turning into? To Danger What are you doing here? Danger: I’m going to England but I knew you’d be disappointed, if I went without sayin’ goodbye to you. Seelie: Good riddance! (She notices Kitty and the melodeon player) And you, what are you doing here? (To Peg) Where’s Tom? Peg: I didn’t see him this morning? Seelie: You mean he hasn’t shown up at all this morning? Seelie: Why didn’t you call me? Tom: A ball o malt! I have a train to catch. Exit Peg. Seelie: What do you mean- you have a train to catch? Where do you think you’re goin’? Seelie: Now listen to me Tom Hannigan! You get that silly notion out of your head right away. Tom: I see nothing silly about it. It might sound silly to yourself and that bunch of Holy Josies you hang around with, but it’s a very serious thing to me. Seelie: (Alarmed) What’s the matter with you, Tom? Are you feeling alright? Tom : Never felt better in my life, except that I just copped on to myself. (Peg enters and hands him a glass of whiskey) I’m getting old Seelie. Do you understand that? In another ten years I will be an old man and what have I done with my life? Damn all! And if I stay here I’ll never do anything I’ve been a mouse for thirty years. But this morning I copped on to myself. I’m going to England Seelie and nothing is going to stop me. Seelie: But why? What put this madness into your head so suddenly? You might have let me know! Tom: I didn’t know myself until this morning. I could never get married here. Seelie: You don’t know what you are doing. It’s the drink! Tom: Oh, I know what I’m doing alright. I know at last. Seelie: But, you have everything you want here. Tom: No Seelie, I haven’t! You have! You have your mass every morning and your devotions every evening. But I’m different, Seelie. I’m weak. I want flesh and blood. Maybe I’ll meet a girl that will take to me. Maybe I’ll turn out like other fellows and be married and have a wife to look after me. “Tis only fair Seelie. You’ll probably tell me to go to Hell, but I can tell you to go to Heaven! Danger: Twon’t be much fun up there if they’re all like her. Tom: I knew she’d say exactly that. DOT: Anyone got the time? My watch has stopped! Johnny: We have thirteen minutes to be exact. Danger: We’d better be getting ready. I never thought I’d see the day I’d be leavin’ Ireland. Alright my lads form a line here. Danger: You are not the first and we will not be the last. God help us! Chins up and let me see smiles on those faces. Don’t blame poor oul Ireland but blame the hypocrites that brought us to this pass. Come on Kitty. Play us down to the station! Your song Peg before we go. Kitty: We’ll play you down to the station. Start up the music Davy. Peg: Now you see what your emigration has done to this country. Now Ladies and gentlemen we would like to present a sketch from the play Philadelphia Here I Come by Brien Friel. We feature Rose Dolphin as Madge, Stephen Conroy as Public Gar O’Donnell and Stephen Conroy as Private Gar O’Donnell and Michael Houlihan will play the complaining father S.B. O’Donnell. Gar (singing) Philadelphia here I come right back where I started from…. (Catches Madge and waltzes with her) Come on Madge what about an old time waltz! Madge: Agh, will you leave me alone. Madge: Stop it, stop it, you brat you! Public: Madge you dance like an angel, but you would give a fellow bad thoughts very quick! Madge: And the smell of fish of you ,you dirty thing! Publi: Will you miss me? Madge; Let me on with my work! Madge: Agh will you quit it, will you? Public: I’ll tickle you until you squeal for mercy. Public: Will you miss me I said? Public: That’s better. Now tell me: What time is it? Public: And what time do I knock off at? Public: Which means on my last day with him, he got ten minutes overtime out of my hide. Instead of saying to me:”Gar my son, since you are leaving me for ever, you may have the entire day free, what does he do? Lines up five packs of flower and says make them into two pound pokes. Madge: He’s losing a treasure indeed! Public: So do you know what I said to him? I just drew myself up and looked him straight in the eye and said to him: Two pound pokes it will be”- just like that. Public: And that wasn’t it all. At six oclock he remembered about the bloody Pollock, and him in the middle of the angelus. “Behold the handmaid of the Lord-Gut and –salt-them –fish. So by God I lashed so much salt on those bloody fish that any poor bugger that eats them will surely die of thirst. But when the corpses are strewn all over Ballybeg, wher will I be? In the little old U.S.A.! Yipee…. Philadelphia, here I come right back where I started from. Private: And it’s all about to begin. It’s all over. Public: And all about to begin. Private: Abandon ship! Make for the life boats! Send for Canon Mick O’Byrne! Private: To hell with women and children, say an Act –of –Contrition. Private: You are full conscious of all the consequences of your decision? Public: Of leaving the country of your birth, the land of the curlew and the snipe, the Aran sweater and the Irish Sweepstakes. Public: I-I-I-I have considered all of these, Sir. Private:Of going to a profane , irreligious, pagan country of gross materialism? Public: I am fully sensitive to this, Sir. Private: Where the devil himself, holds sway, and lust – abhorrent lust is indulged in shamelessly, Sir, shamelessly. Public: “Who are you tellin”? Shamelessly, Sir, shamelessly. Private: And yet you persist in exposing yourself to these frightful dangers? Madge: Oh you put the heart across me there! Get out of my road, will you and quit eejiting about! Public: Madge you’re an ould duck. Madge: Aye so. There’s the case and there’s a piece of rope for I see the clasp is all rusted. And there’s your shirts and your winter vests and your heavy socks. And you’ll need to air them shirts before you- Don’t put them smelly hands on them! Madge: See that they’re well aired before you put them on. He’s said nothing since I suppose. Madge: He’ll have something to say then, you’ll see. And maybe he’ll slip you a couple of extra pounds. Public: Whether he says goodbye to me or not, or whether he slips me a few miserable quid or not, it’s a matter of total indifference to me Madge. Madge: Aye so. Your tea’s on the table- but that’s a matter of total indifference to me. Public: Give me time to wash, will you? Madge: And another thing: just before: just because he doesn’t say much, doesn’t mean that that he hasn’t feelings like the rest of us. Public: Say much, he said nothing! Madge: He said nothing either when his mother died. It must have been near daybreak when he got to sleep last night. I could hear his bed creaking. Madge: Don’t come into your tea smelling like a lobster pot. Public: If he wants to speak to me he knows where to find me! But I’m damned if I’m going to speak to him first! (Calling after her) And you can tell him I said that if you like. Private: What the hell do you care about him. Screwballs! Skinflint! Skittery face! You’re free of him and his stinking bloody shop. And tomorrow morning, boy, when that little old plane gets up into the skies, you’ll stick your head out the window and spit down on the lot of them. Private: Let the bugger call. SB: How many coils of barbed wire came in on the van this evening? Public: Two or was it three? SB That’s what I am asking you. It was you who carried them in! Public: There were two or was it three, or maybe it was …was it two? Private: What sort of a stupid bugger are you? Think man you went out and stood yarning to Joe the post; then you carried one coil into the yard and came out with the sack of spuds for ther parochial; then you carried in the second coil… and put it in the corner… and came out again to the van… and…. (Public skips into the air) Ah, what the hell odds! That’s his headache, old Nicodemus! After tomorrow a bloody roll of barbed wire will be a mere bagatelle to you. Yeah man. You see thare plains stretching as far as the eye can see, man? Well them thare plains belong to Garry The Kid. And Garry The Kid, he don’t go in for any of your fancy fencing, no siree. And what will you wear on the plane tomorrow old rooster eh? Now we present Eanna Ryan who will lead into the All-Ireland 2017 and reminisce about Galway’s win in 1980. Eanna: The All Ireland final of 2017 was upon us. We didn’t know whether to look left or right; but we knew there was one road and that was the road to Croke Park. I got up in the morning and Maureen said to me, “will I put on the usual and she said I’ll throw in a stake on the fry as well. I was delighted with that because I knew what was in front of me once I got to that train station in Athenry; there was no stopping me. I devoured the fry, the whole shebang because I knew that I would need the calories before the day was out. I went out into the yard and I saw six heads looking out over the hedge at me. I knew if I didn’t give them a bit and if Galway won the all-Ireland this year; they mightn’t see me again for a week. Out of guilt, I gave them silage and meal and out of guilt I threw in an extra bit as well. It was like as if they knew that something had landed. Even the dog was nervous, but he too knew that something big was up. I knew that under Michael Donoghue that Galway had a different class of an athlete this year. I filled the dog’s bowl with pedigree chum. I knew that there was a different pedigree in that team this year under Michael Donoghue. Off I went to Athenry on the High Nelly going about 200 mile an hour up the road, well I left rubber on the road I was going so fast. I had a few things to do before I met Higgins. I headed straight for the bookies and I left 200 euros on the counter. The bookie said to me, “what’s that for?” “ I want the whole shebang on Galway.” I knew they were going to do it this year. I took my docket and left it in my inside pocket because I knew it would be safe in there. I came out of the bookies and I met Higgins. I said to him, “have you the train tickets?” He said, “no, I thought you were going to get them.” “No” I said, “I’d get the tickets for Croke Park, you were supposed to get the train tickets.” Off he went to the station to get the train tickets. The fry had nearly me killed with the thirst so I went in for a coffee and ordered a packet of crisps and a pack of peanuts as well. I headed down to the station and when I saw the platform a sea of maroon, there were Galway flags, Galway scarves and Galway hats. The banter was something else, I knew this was our time, people were singing the Fields of Athenry. The train came and arrived at a standstill and with a puff of smoke we were gone. I sat in the train and from the crisps the fry and the peanuts I got very tired and I started to reminisce. Eanna goes back to a bench and falls asleep and dreams about Galway winning the All-Ireland in 1980. Narrator: The Tribesmen, captained by talisman and inspirational figure, Joe Connolly, overcame a 57-year famine, dating back to 1923, to win back the Liam McCarthy Cup. They secured ‘Liam’ with a three-point victory over Limerick on a score line of 3-09 to 2-15. Narrator: The full-time whistle was greeted with an outpouring of emotion from Connolly and the Galway faithful. The famine had ended and the west had awoken. Connolly’s passion, hurt and joy were all vividly displayed in his iconic speech which was delivered all through his native language, Irish. The speech was delayed by 10 minutes, such was the emotion of the huge crowd caught up in the moment and it took Joe Connolly ten minutes to anchor his iconic speech and confer it to the annals of history and capture a supreme moment for the population of a county who had a barren period for the previous 57 years and help a county win back their true identity. The Galway captain claims that day was like a spiritual re-awakening for a population that had been severely impacted by a famine in the 1800s and followed by mass emigration in the 1900s. What made Connolly’s speech so special was the fact that it came from the heart. No paper, no preparation. His speech, delivered from the steps of the Hogan Stand, was one of true passion, and from the heart. His decision to speak in Irish, his native tongue, struck a chord, as did his remembrance of emigrant families and friends, a decade before Mary Robinson began speaking of the Irish diaspora. GALWAY HAD waited a long time for an All-Ireland hurling win by 1980.The celebrations didn’t just end with the speech as he handed the microphone to Joe McDonagh – later GAA president – who led the crowd in a version of The West’s Awake, a stirring ballad by Young Irelander Thomas Davis, with lyrics adapted for the occasion. A mhuintir na Gaillimhe, tar eis seacht mbliana is caoga, ta Craobh na hEirinn ar ais i nGaillimh. Is mor an onoir domsa, mar chaptaen, an corn seo a ghlacadh ar son an fhoireann uilig. Ba mhaith liom buiochas a ghabhail do cupla duine a chabhraigh go hiontach linn ar feadh an ama. Na Triur roghnaitheoiri, Phelim Murphy, Bernie O’Connor, agus go mor mhor Cyril Farrell achuidigh linn e seo a bhaint amach, freisin ce a dhean fadh dearmad ar Inky Flaherty. Bhi beirt eile, Willie Bennet an masseur, agus Mary McInerney a thug cunamh iontach e seo a bhaint amach. Agus ba mhaith liom failte agus buicohas faoi leith a chur ar bheirt a bhi ag imirt le Gaillimh le linn na blianta agus toisc go raibh said gortaithe nach bhfeadfadh leo bheith anseo inniu. B’ iad Jack Lucas agus an tAthair Iggy Clarke. The crowd appealing for Iggy…… and there he is, he is coming, he’s there. John Fleming as Iggy arrives up on stage. Is iontach an la inniu le bheith im imreoir Ghaillimheach. Ta daoine air ais I nGaillimh is ta gliondar in gcroithe. Agus Freisin caithimid cuimhneamh ar dhaoine I Sasana, I Meiricea ar fuaid na tire agus ta said b’fhfeidir ag caoineadh laithreach. Just le criochnu suas, ba mhaith liom buiochas a ghabhail do fhoireann Luimnigh as ucht an cluiche iontach a thug said duinn inniu. Agus ba mhaith liom, ar bhur son tri screach a thabhairt do Luimneach. Narrator:Eric: I don’t know about you, but I am all shook up after that. Natalie: C’mon everybody and clap your hands like this. Natilie: Camoige girls of Galway pick it up once more now repeat after me. Camoige Girls: (Lovin this babe), Lovin this babé (Lovin this babe), lovin this babé Two thousand seventeen. Chad: Hey Ladies, mind if I watch? Sandra: Chad O’Hara you couldn’t win at a game of ‘Snap’ never mind a competitive sport. Chad: Oh Come on Sandra, I’m just jokin around, can’t you girls take a joke! Sandra: Oh we can take a joke alright! but I’d like to see you hit a sliothar! Girls: Yeah Chad, if your so brave why don’t you try hit this sliothar down the hall? Chad: Hit this? ..Hah no problem. Sandra: Mmmhmm, your all talk! Chad: Come on Sandra, prove me wrong- Come to the dance with me tonight! Chad: Well honey, sophistication is my middle name. Natilie: I’ll catch up with you Sandra! Chad: Hey Natilie, You think I’m a joke too? So are you gonna go to the dance tonight? Chad: Naa, I gotta keep hittin that skyroad Natilie, there’s somethin out there for me, I just haven’t found it yet. Even the global Irish family nurture such deep loyalty to Irish identity and culture. Ireland has a lot of friends across the spectrum of nations often earned for us by our distinguished and talented emigrant families. Sean Og O’ Halpen’s mum hails from the Figi, Lee Ching plays for Wexford. 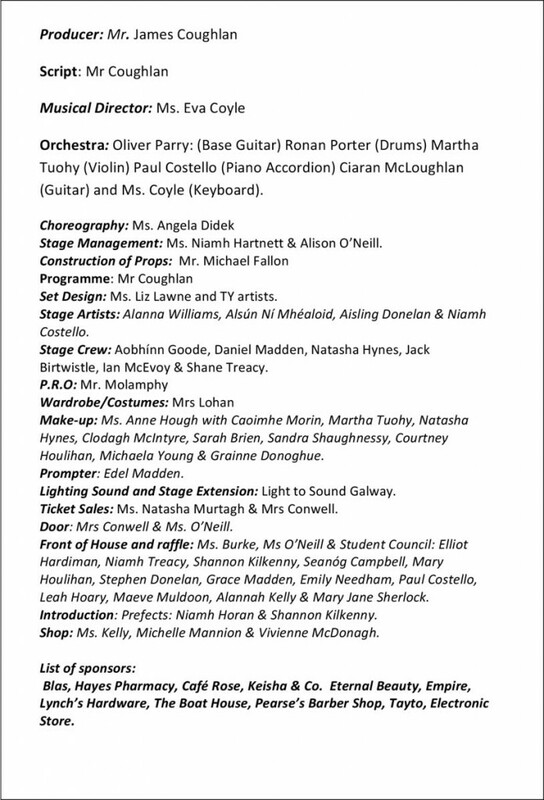 To highlight this, the TY’s will sing an adopted song from Joseph and His Amazing Technicolour Dreamcoat to highlight the amount of foreign nationals who have played our national games with us. They have called it Transition Year Calypso. Oh no, not him,how you can accuse Liam is a mystery, save him take me, the GAA is bigger than a tall oak tree. I hear the Artane boys play their song; they’re singing man you know you got it wrong. I hear the voice of the Galway crowd singing in the Hogan is not so proud. “The Fields of Athenry” rings out so true. Jason, Joe and David are to thank for sure. You see them running to and fro. And we all know the crowd want more. The fields of Athenry ring out so true. Narrator: In the musical The Micado by Gilbert and Sullivan Coco has a little list of things he dislikes in society. This song was written for Transition Year with a G.A.A. theme and it’s called T.Y’s Little List. T.Y. 2017 will now present their version of the famous Micado song. TY’s Little List 9 TY’S needed for this song. Who never would be missed! I’ve got them on the list. They’ll none of them be missed. They give out and bark and bit about the players in the game. I’ve got them on the list and they’ll none of them be missed, they’ll none of them be missed. There’s the players who chew gum and puff it in your face. They never would be missed, I have got them on the list and they’ll none of them be missed, they’ll none of them be missed. The Kilkenny team who were beaten early on in 17. I have them on the list. And sell them above their value on Jones’ road. Music stops. No they never will be missed. I’m sure they’ll not be missed. For they’d none of them be missed. They’d none of them be missed. Narrator:Eric: Betting has been an issue in all sports, here we have Killian Dunne, Courtney Duane, Billy Donlon and Dylan Mannion with a short play on the issue of betting. Betting Office, the clock strikes one. Woman: Am I late for a bet on the first race John? John: You ‘re not, it’s just one and the race is not until one 20. Woman: All right sixpence each way on water spriet. Woman: Water spriet, are you deaf? John: Show me your docket. Oh Water Sprite. Woman: Did you think I saiud Porther Spriet. John: Well it’s a good thing that you don’t spell it the way you say it or you would never get paid on it even if it did win. Woman: What do you mean even if it did win, I had a great tip about it. Wait a minute. Gimme me shillin’ for a minute. John: Do you want the money on or not? Woman: I do, but you have upset me mind now, with your even if it did win. If I back the favourite at eleven to two on, what do I get for my sixpemnce each way? John: Ah don’t be bothering me (telephone rings) Yes Sir, right 2 and 6 each way on Rolling Pin… First race, five shillings, right Sir. Woman: Rolling Pin? That’s in the first race as Wather Spriet. Does the paper tip that one? John: Yes, some of them. Woman: Didn’t it sprain a fretlock last week? Woman:What does it say about it in the Nemarket Gallops? Did it do a rattlin at seven furlongs at a useful pace or anything…. John: Ah will you gallop out of my sight, for Heaven’s sake. I’m busy. Woman: Don’t be so cross. Rollin Pin. This is me day for bakin griddle cake, so I think I’ll chance me bob on that one. John: Chance it on something for the love of Mike, and don’t be standing in people’s way. Woman: Very Well, keep your hair on. Sixpence each way on Rollin Pin. John: That’s all right sir. Credit half. Ticket sir. Good morning. Man: Good morning madam, good morning. Sorry for interrupting you. Woman: It’s all right sir. You’re welcome. Eh, John what was he backing? John: Mind your own business, here take your ticket, tanner each way Rollin Pin. You’re more trouble than you’re worth. That gentleman put down 10 pounds and it take him a minute, Turtle Dove too. First bet I’ve had on that one. Woman: Turtle Dove, that’s in the first race too, with Wather- Spriet and Rollin Pin. Wait a minute, I think I’ll change me docket. John: Ah go and have a bark at yourself. How many more will you fancy? Woman: Don’t be impudent, or I’ll place my commissions elsewhere in the future. John: I wish you would, you and your sixpence each way and your thrupenny trebles. Woman: Yer very impertinent. It’s no wonder ther’re puttin’ a tax on yez. John: Hello, hello. This Mack’s. Oh, is that Mr Blake? Yes, sir 10 pounds to win. Yes, and four pounds a place. Right on Romping Raymond. That’s all right sir . The first race. John: You’ve no right to be listening into my telephone conversations. Woman; I have a cousin in Australia named Raymond. I think, I’ll chance me arm on Rompin Raymond. 2nd Man: Morning John. Excuse me Mrs Finnegan, I’m in a hurry. Take this docket, John. Red Rover. Yes, each way. The first race. John: There y’are, your ticket. John: Here. Tanner each way Rompin Raymond. Take yer ticket and go. Woman: Is Red Rover one o’ Harris’s horses? Jimmy Boyle musta had a wire about it or he wouldn’t be backin’ it in such a hurry. Woman: Did Red Rover win his last race? John:Will you take your ticket and get out of my sight. Woman: It’s your own fault for puttin’ me off of Wather Spriet, I’m not goin’ to risk me money without due considerhation. John: Here’s your shilling and go and buy bull’s eyes with it. Woman: I’ll report you to your boss, it’s the likes of me that helps to buy his roll’s Royce for him. John: Very well take your shillin’ and go and buy Bull’s eyes with it. Woman: Put me shillin on Red Rover. John: You’re too late. Here’s the result of the first race now. Hello. John: Hello. Yes. First race. Yes. Won by ten lengths. By what? Water Sprite. John: What’s the SP on that one? Yes 20 to 1. A fuel injection cutoff and chrome planted rods oh yeah…. Danny: Some match lads, some match! Rump: Yeah Danny, why don’t you tell us about that girl you kept staring at in the stand! Danny: What are you talkin bout Spritzer, (pushes Rump away) Give a guy a break! Jan: Like does he have a car?! Males: Uh well-a well-a well-a huh! Frenchie: Sandy, aren’t ya comin to the dance tonight? Sandy: Aw don’t think so Frenchie, don’t really feel so good. Frenchie: Oh I’m sorry..you know the girls are all comin over to mine, we’re gonna get ready, why don’t you come too, you might feel better? Frenchie: Come on, what ya waitin for?! Sandy, can’t you see I’m in misery? Riverdance was first performed during the seven-minute interval of the 1994 Eurovision Song Contest at the Point Theatre in Dublin. The performance was transmitted to an estimated 300 million viewers worldwide and earned a standing ovation from the packed theatre of 4,000 people. The performance is often considered the most well-known interval act in Eurovision Song Contest history. Lead dancers Michael Flatley and Jean Butler transformed the previously chaste and reserved traditional dance form into something else entirely. 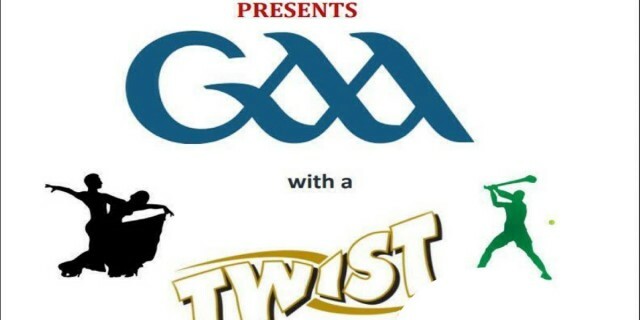 Narrator: A GAA club captures the essence of Irish rural life and has given us as a nation, a distinctive identity, a cultural identity that has laid the foundation for future generations to cherish and enjoy which is a strong sense of community which offers young people to grow and belong and anchor each person in the community. Host: Hello and we’re coming to you live from the midlands community centre, its’ here we gonna be a rockin and a rollin, this is a celebration of our fine counties and let’s give it up for the mainliners- let’s grab your partners and away we go!! The doctor paid, and laid me down, with a semitone bouncing all around. Sandy: Oh Danny, we’ve tried this, and this long distance thing could just never work out between us. Galway is a good 3 hours from Waterford. Danny: Sandy, It’s just a dance! Sandy: Danny If I dance with you gotta promise me something! Danny: Ah Sandy, what are you doing to me! Natilie: wise men say, only fools rush in- but I can’t help falling in love with you. Surely to the sea, Left. Speaker 1: Well ladies and gentlemen we are almost finished with our tale. Speaker 2: Let’s recap some of the achievements of Croke Park. Speaker 3: One of the finest stadiums in Europe. Speaker 4: In 2003, the stadium in Croke Park provided the backdrop for the spectacular opening and closing ceremonies by hosting the special Olympics; a capacity crowd welcomed the athletes, their families along with over 31,000 volunteers, of all ages and backgrounds; on a night of celebration and unmatched atmosphere and remains an outstanding memory in special Olympic history and the history of the G.A.A. Speaker 5: In May 2011, Queen Elizabeth 11 became the first British monarch to come to Ireland in 100 years and included Croke Park in her state visit. Speaker 6: GAA clubs provide our youth with an anchor of belonging because a sense of belonging liberates players but provides them with a sense of identity where their dreams are first seeded. Speaker 7: Clubs also provide a frontline against mental wellbeing, obesity and dietary needs and they also provide comradery and networking for players who emigrate; a G.A.A. club provides opportunities for work, advice where to live and very often is a life-line for those who find themselves in a foreign country, a vibrant voice as well as rich source of entertainment. Narrator: A conflict in Irish history that seemed intractable has been quelled by the politics of peace, based on justice and parity of esteem all of which has disappeared into the footnotes of history. The global Irish family has nurtured such a deep loyalty to the Irish identity and culture. Ireland has a lot of friends across the spectrum of nations often earned for us by our distinguished and talented emigrant families. Since its foundation in the late 19th Century, the association has grown to become a major influence in Irish sporting and cultural life with considerable reach into communities throughout Ireland and among the Irish diaspora. Surely to the sea. Left. 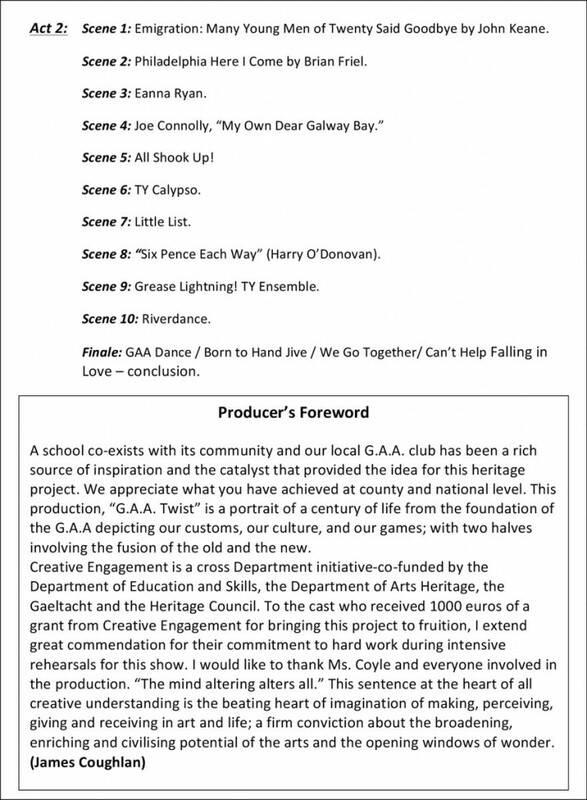 This compilation was scripted by Mr James Coughlan, Deputy Principal Portumna Community School as a project for our Transition Year class and entered as a Creative Engagement entry for the academic year 2017-2018. 27/11/2017.